Alumnus Joseph Daragan ‘71 and his wife, Pam, recently donated their collection of 18th and 19th century almanacs to William & Mary Libraries. 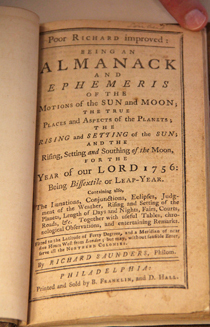 Among the collection’s more than 450 almanacs is a first edition copy of Poor Richard’s Almanack, published by Benjamin Franklin in 1756. Daragan purchased his first almanac at a bookshop in Williamsburg when he was a student at William & Mary. Over the next 45 years, he amassed one of the two largest privately-owned collections of early American almanacs. “This donation has put William & Mary Libraries among some of the premier collections of almanacs held by libraries in the United States,” said Jay Gaidmore, director of the library’s Special Collections Research Center, the collection’s new home. Long before the Weather Channel and CNN, people got their weather information and news from almanacs. These annual publications included weather forecasts, farmers’ planting dates, tide tables and calendars, useful to townspeople looking to travel from one town to another. In addition, readers could find astrological data, as well as op-eds on political issues. 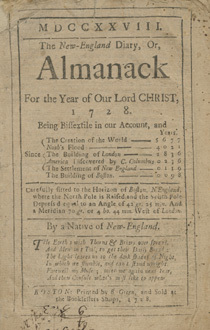 “Almanacs are important examples of early printing, printmaking, and publishing. We believe this collection will be a valuable resource to our history faculty and students,” said Gaidmore. The collection includes American almanacs dating from 1728 to 1907, as well as a small number of foreign almanacs published in England, Ireland, Canada, Australia and Jamaica, with the earliest dating from 1677. Several almanacs in the collection feature unique inscriptions, as owners frequently used blank pages inside almanacs for diaries and daily planners. Some of the collection’s Revolutionary War-era almanacs feature maps of battles and descriptions of the battle of Lexington. Confederate States imprints include a Vickburg almanac whose owner noted the day the Union Army came through the area.